I didn’t notice this article until going through the newspaper today before recycling it, but this is good news for the City of Clayton and it’s smoke-free air efforts, led by progressive Mayor Linda Goldstein. The original lawsuit generated a lot of publicity when it was first filed by Clayton attorney Mr. Bevis Schock, who had sought a plaintiff. He found a willing cigar smoker in Mr. Arthur Gallagher, who responded to an ad. Following is just one of the numerous stories posted on this blog featuring a clownish photo of the group deliberately violating the new law. Mr. Hannegan cannot see any problem with drifting cigar smoke in a public park. If Mr. Gallagher were to wear a fish bowl over his head while puffing on his cigar I’d agree. The lawyer is reportedly planning to appeal. Since it’s his time and money, good luck with that. CLAYTON • A federal judge has dismissed a lawsuit against Clayton that sought to overturn the city’s ban on smoking on outdoor, city-owned property, including public parks. “The city was confident that our ordinance was enacted properly and within the authority of municipal public health concerns,” said Mayor Linda Goldstein. Attorneys W. Bevis Schock and Hugh Eastwood filed the suit on behalf of resident Arthur Gallagher, who enjoyed smoking cigars in city parks. The suit claimed that the ordinance violated Gallagher’s constitutional rights. Among the arguments, the suit said that ‘smoking is a fundamental right” and asserted that smokers are persecuted and members of a legally protected class. Schock said Monday that his client would appeal. “It really comes down to whether the federal courts are going to hold the line where there really isn’t any evidence of health benefits at all” for banning outdoor smoking, he said. “The question is whether they are going to let the members of the Board of Aldermen — who respond to fashion — infringe on our liberty. In his 15-page opinion, U.S. District Judge Charles Shaw dismissed the federal constitutional claims. Clayton banned smoking in most public buildings in July 2009, effective July 2010. At the urging of the parks commision and then-Alderman Alex Berger III, the city expanded the ban to include outdoor publicly owned spaces starting Jan. 1. The lawsuit was filed by Schock in March. The outdoor ordinance bars lighting up in parks, on playgrounds and all other city-owned or leased facilities. That includes city-owned parking garages and lots. The law allows smoking on sidewalks, streets and alleys. Penalties are up to a $1,000 fine and 90 days in jail. 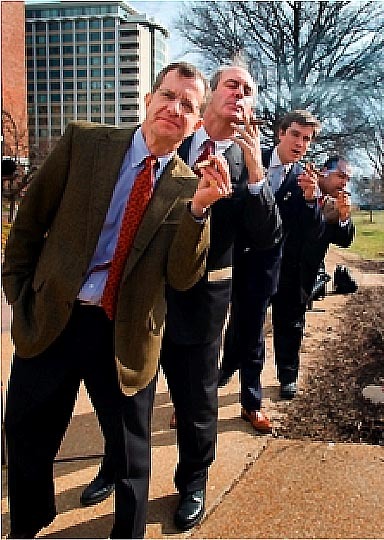 “We thank the court for upholding the strong consensus among Clayton residents that smoking in public places is something they want in their history, not their future,” Goldstein said. MoGASP, I can’t see going after cigar smokers when other Clayton residents can cook over open fires in Clayton parks. Seems like a double standard to me. I don’t believe Mr. Gallagher responded to our ad. He and Bevis Schock attend the same church and are both are cigar smokers. I am glad Mr. Gallagher was brave enough to step forward in defense of his rights as a Clayton citizen. Another Clayton cigar smoker initially signed on to the legal challenge but dropped out due to fear of retribution from Clayton officials. mogasp comment: There are many examples of contradictory laws and often the reason is historical. Marijuana smoking is illegal while cigarettes, despite now being identified as the leading cause of preventable death in this country, can still be purchased in Walgreens. As to fear of retribution, speaking out against smoking when I ran a lab. at McDonnell Douglas Astronautics Co., St. Louis, didn’t endear me to management either. In fact, on one occasion my efforts brought the veiled threat of being fired. I have always found it fascinating that the same individuals that decry a government imposing a smoking restriction on a “private” business as undue interference in the “private” operation of a business yet they decry a government imposing restrictions on the government’s own property. Obviously, what they are really upset about is having their smoking restricted, not impact on a business. And I put quote marks around :private” because any business open to the public is subject to regulation – and they know it. Mr. Gatton, Mayor Goldstein and the Clayton aldermen don’t own the Clayton parks. They need to offer a good reason to justify forcing a Clayton citizen like Mr. Gallagher to discontinue his enjoyment of a Clayton park. define them. To them everything is theirs. It is odd that nothing seems to be at this site about the 450 or so registered (legal) tobacco pesticides and their residues in typical cigarettes. Then, of course, there’s nothing about how some top pharmaceutical firms (supposedly health industries) make tobacco pesticides. Nothing here about dioxins from chlorine pesticides and bleached paper….or about how many so-called “smoking related” diseases are identical to symptoms of dioxin exposures. Nothing about added burn accelerants, or added addiction-enhancing substances, or sugars galore (to attract kids), or the many many untested non-tobacco additives used by cigarette makers to flavor, soothe, sweeten, and fatten up their products. And nothing about any number of cigarette brands that contain no tobacco whatsoever. The Antis say it’s all “tobacco”. Do we naively believe them? Isn’t is EASY just to ask…”How do you know it’s tobacco or just tobacco?” ( or “….tobacco smoke?”). Is it plain tobacco, or highly contaminated tobacco, or even fake tobacco? Where’s the tests? Without certifiable tests of the cigarettes in question or their smoke, any testimony in court is either hearsay or, perhaps, perjury. mogasp note: Thank you for confirming your full name. Excess character count being allowed on this occasion. Are churches in Clayton allowed to use candles and incense? How’d that exemption slip in? After all, that stuff seems pretty additive, as people keep going back to those churches every Sunday. How cold it is to subject church goers to untested second-hand candle and incense smoke? They are people, not Guinea pigs. If there are any Native American groups in Clayton, are they allowed to use tobacco in their religious ceremonies as has been traditional for about, oh, ten thousand years?